Etsy stock hit a bit of turbulence at the end of December, but shares still more than doubled across 2018's trading. Shares of Etsy (NASDAQ:ETSY) dipped 12% in December, according to data from S&P Global Market Intelligence. The e-commerce platform posted strong gains in 2018 but lost some ground at the end of the year amid steep sell-offs for the broader market. Last month was a turbulent time for stocks, with major indices posting their worst percentage-based performance in a December period since the Great Depression. While there wasn't any company-specific news behind Etsy's sell-off, and the company has otherwise evidenced strong momentum, its stock was not immune to the market's slide. 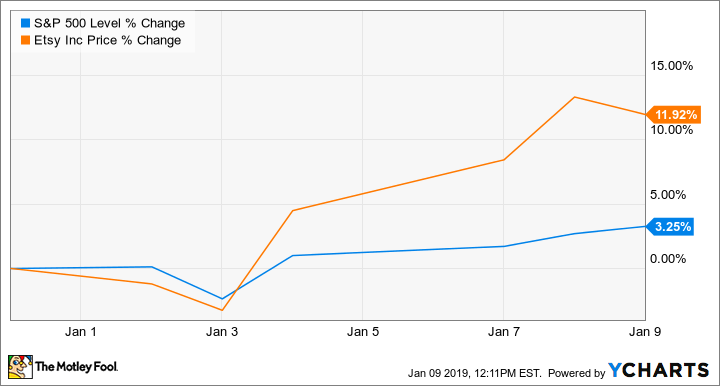 Given that the company has seen such explosive stock gains and trades at a highly growth-dependent valuation, Etsy's sell-off last month was not as bad as it could have been and seems to suggest shareholder confidence in the business. 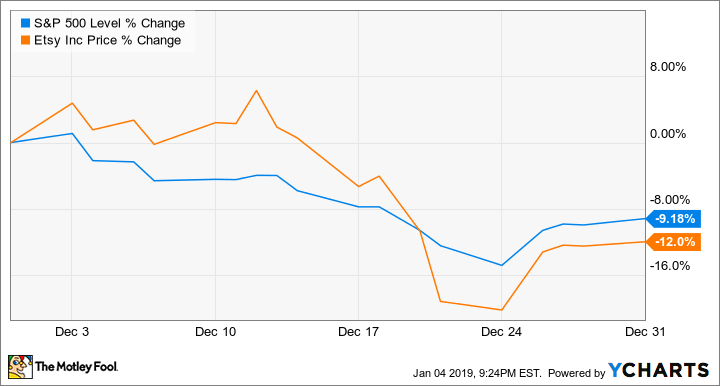 Etsy's December's sell-off came on the heels of a 27% rally for the stock in November that stemmed from the company's strong third-quarter results, and it's not surprising that shares retraced gains last month amid the market's shake-up. Etsy stock has regained much of the ground it lost last month, as data showing strong momentum for the U.S. economy and consumer discretionary spending has lifted the market. The company's shares trade up roughly 11.9% in January so far. Etsy has been powering strong growth by expanding the reach of its platform, increasing engagement, and hiking prices for its services. The company's revenue grew roughly 41% year over year in its last reported quarter, adjusted EBITDA climbed 49.5%, and management expects that its recently wrapped fiscal year will post roughly 35% annual sales growth and $132.5 million in adjusted EBITDA. However, investors will have to weigh Etsy's strong growth and promising outlook against the stock's elevated price. The company is valued at roughly 65 times the average analyst earnings target for its 2019 fiscal year. Check out the latest Etsy earnings call transcript.